KE00003 is a solid phase sandwich Enzyme Linked-Immuno-Sorbent Assay (Sandwich ELISA). 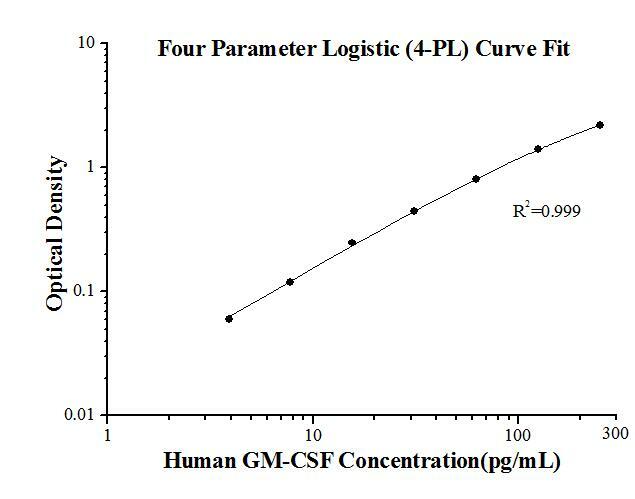 The GM-CSF ELISA kit is to be used to detect and quantify protein levels of endogenous GM-CSF. The assay recognizes human GM-CSF. A polyclonal antibody specific for GM-CSF has been pre-coated onto the microwells. The GM-CSF protein in samples is captured by the coated antibody after incubation. Following extensive washing, a monoclonal antibody specific for GM-CSF is added to detect the captured GM-CSF protein. For signal development, horseradish peroxidase (HRP)-conjugated antibody is added, followed by Tetramethyl-benzidine (TMB) reagent. Solution containing sulfuric acid is used to stop color development and the color intensity which is proportional to the quantity of bound protein is measurable at 450nm. CSF2, also named as GM-CSF, is an important hematopoietic growth factor and immune modulator, which is produced by a variety of cell types including T cells, macrophages, endothelial cells and fibroblasts upon receiving immune stimuli. It was originally recognized as a stimulator for the proliferation of granulocytes and macrophages from bone marrow precursor cells. It has also been shown to promote the survival and activation of mature myeloid cells and therefore contributes to the maintenance of innate immune homeostasis. Recent studies suggest that GM-CSF also has proinflammatory functions and plays critical roles in the development of autoimmune and inflammatory diseases, particularly in Th17 driven diseases. GM-CSF also plays a role in embryonic development by functioning as an embryokine produced by reproductive tract.